The GAH Police High Visiblity Patrol Vest (top) and GAH Patrol Vest provide anti-stab / ballistic protection for Police patrols. The GAH Tactical EMAS Vest is specially-designed body armour for police firearms departments. The GAH Unisex Covert Vest can be worn under clothing to provide anti-stab and ballistic protection. 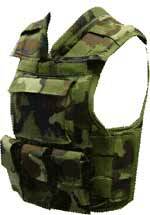 GAH Military Operations Vest - GAH offer a wide choice of body armour designs for army, air force and naval requirements. PASGT Helmet (top) and Specialist Equipment including flotation vests, de-mining suits, ballistic blankets / bolsters, public order suits; and a complete range of anti-riot equipment and tactical gloves. Global Armour Highmark Ltd (GAH) is headquartered in Northern Ireland and develops, manufactures and supplies a wide range of dual-purpose body armour solutions offering the best possible weight and flexibility. We achieve this by vigorous development and testing using our in-house ballistic and stab-test facilities and develop tailor-made concepts with our police and military customers. GAH currently supplies the majority of personal issue body armour to United Kingdom police forces and we pride ourselves on being a leading innovator in the industry. Our experience and knowledge of the product spans over 25 years and is demonstrated by our armour designs and quality. All body armour designs can be tailor-made to each customer's exact requirements and we also offer made-to-measure sizing for optimum comfort. To date we have created 400 individual concepts for our customers worldwide. GAH holds ISO 9001 quality accreditation guaranteeing high quality products and services. We are also able to offer the full range of NIJ certified armour systems. 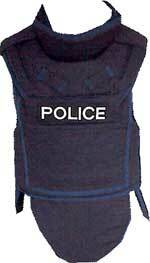 Our core business area is the supply of tailor-made body armour designs for police patrol operations. Currently GAH supplies 25 UK police forces with their patrol body armour requirements and has an extensive range of designs and options available. 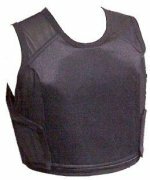 Body armour solutions can be provided in waistcoat or tabard styles utilising a broad range of materials, fastenings, adjustment and pocket configurations. A common feature of all our patrol designs is an innovative lumbar support to reduce stress on the lower back. This feature was developed and pioneered in the early 1990's and has been endorsed by an experienced chiropractor. Recent demand from other sectors such as private security, ambulance trusts and fire services has lead to GAH introducing new concepts in this field. GAH is proud to be one of the major body armour suppliers to UK police firearms departments and takes pride in working closely with each individual force to produce designs meeting exact operational requirements. Close co-operation ensures that GAH understands the needs of each police force and our wide range of dual-purpose and ballistic-only solutions provides maximum choice to our customers. Demand for covert body armour designs has increased significantly over the last number of years and GAH has an extensive range of covert armour solutions to meet the requirements of our customers. Covert armour solutions are available in choice of colours to meet particular operational requirements. 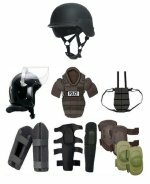 GAH has made developments in body armour solutions for military operations and we offer a wide choice of body armour designs for army, air force and naval requirements. The protection requirements of military customers are quite specific and GAH is pleased to work closely with any department to develop and test concepts for final approval stage. We offer a complete range of ballistic helmets, including helmets designed especially for the police, military and demining. Our helmets provide high ballistic performance with low weight, through a unique manufacturing process using high tenacity ballistic aramid bound in a thermoplastic resin matrix. All our helmets are tested in the US according to NIJ standards; and our standard Level IIIA PASGT helmet weighs only 1.1kg. GAH offers a complete line of high-performance steel, ceramic and lightweight polyethylene armour plates. These plates will provide protection against high-velocity weapons and are tested in accordance with National Institute of Justice (NIJ) standards to provide both ICW (In Conjunction With) and stand-alone Level III and Level IV protection. With over 25 years of involvement in the armour industry we have developed a range of specialist equipment including flotation vests, de-mining suits, ballistic blankets / bolsters, public order suits; and a complete range of anti-riot equipment and tactical gloves.